1807: born in Kamigata. He was the son of Nakamura Mitsuzô. He started his career at an early age as a disciple of Mimasu Tanin III and successively received the names of Mimasu Fukunosuke I and Mimasu Kuranosuke I. 1831: he took the name of Mimasu Tanin IV. 1830s: he spent most of his time performing in miyaji shibai around Kyôto or in hama shibai (Ôsaka). 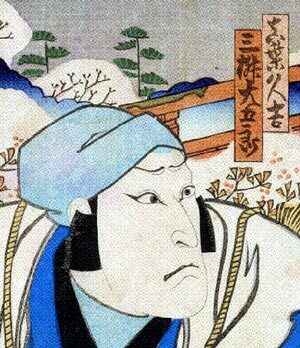 11th lunar month of 1843: Tanin played at the Chikugo no Shibai the role of Yoshitsune in the drama "Yoshitsune Senbon Zakura"; the roles of Shizuka Gozen and the fox Genkurô were played by Arashi Rikaku II and Nakamura Shikan III. 1845: Mimasu Tanin IV took the name of Mimasu Baisha I. 3rd lunar month of 1845: Baisha went to Edo and played at the Ichimuraza the roles of Iwami Tarô and Kôsuke in the drama "Shôutsushi Kaga no Sugatae". 4th lunar month of 1845: Baisha achieved a great success in the same theater by playing the role of Sasaki Takatsuna in the drama "Kamakura Sandaiki"; the roles of Princess Toki and Miuranosuke were played by Bandô Shûka I and Ichimura Uzaemon XII. Fall 1846: he became disciple of the star Nakamura Utaemon IV. 11th lunar month of 1846: Mimasu Baisha I took the name of Nakamura Gennosuke II at the Ichimuraza, performing in the drama "Gekiryômaru Ichiban Ikari". Summer 1850: he went back to Kamigata and took back back the name of Mimasu Baisha I. 13th day of the 5th lunar month of 1859 : his master Mimasu Daigorô IV died. 10th lunar month of 1859: Baisha played at the Kado no Shibai the roles of Yoshitsune and Yokawa no Zenji Kakuhan in the drama "Yoshitsune Senbon Zakura"; the roles of Shizuka Gozen and the fox Genkurô were played by Arashi Rikaku II and Onoe Tamizô II. 11th lunar month of 1864: Mimasu Baisha I took the name of Mimasu Daigorô V at the Minamigawa no Shibai, performing in the drama "Kanadehon Chûshingura"; the performance was interrupted one day by a big brawl within the theater between members of the Shinsengumi and rivals. 1st lunar month of 1865: Daigorô's rank in the Kamigata hyôbanki was shi-jô-jô-kichi (unique - superior - superior - excellent). September 1873: Daigorô appeared on stage for the last time, playing at the Kado no Shibai the role of Ôshio Heihachirô in the drama "Ôshio Uwasa no Kikigaki". He suddenly fell ill and had to be replaced by Ichikawa Ebijûrô V.
1st of November 1873: Daigorô died in Ôsaka. Mimasu Daigorô V was a talented tachiyaku and jitsuaku actor, famous for his great stage presence and excellent in budôgoto roles. His vocal projection and the way he delivered his lines were both outstanding. He focused on fukeyaku roles in his latter years. The 13th day of the 5th lunar month of the 6th year of the Ansei era was the 13th of June 1859 in the western calendar.